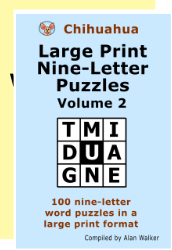 Get printed puzzles similar to the word puzzles on this website in a series of Chihuahua Word Puzzles books. They are available from Amazon, Amazon UK and other online booksellers. How many words can you make using nine letters? How many words can you make using ten letters? Quicker puzzles, but more of them. See how you measure up against the top online players. Quicker puzzles, in a compact format. Make words using seven different letters. All text is in well-spaced 16-point typeface. Puzzles like these have been around in one form or another for over 100 years. They are known by many names: Target, Word Hunt, Polygon, Wordwheel, etc. The puzzles in the Chihuahua series of books challenge you to make as many words as you can from a set of nine or ten letters. All words must be four letters or longer, and include the letter in the middle of the puzzle. 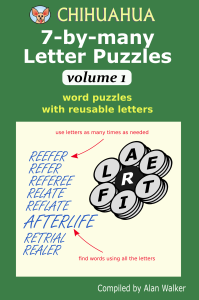 7-by-many puzzles are slightly different: they have seven different letters and words must be at least five letters long, but letters can be used multiple times. There is always at least one word using all the letters. There are five target levels for how many words you find. Good, Better and Best are targets you may be able to reach using words that are fairly well-known. But you will need to know a lot of obscure words to achieve either of the two highest target levels, Maven and Cham. Full solutions are provided at the back of each volume, with the common and rare words listed separately. These publications are not available over the counter anywhere, and probably never will be, so if you want them, you'll have to get them online. Go to Amazon.com, or check out your favourite online bookstore.